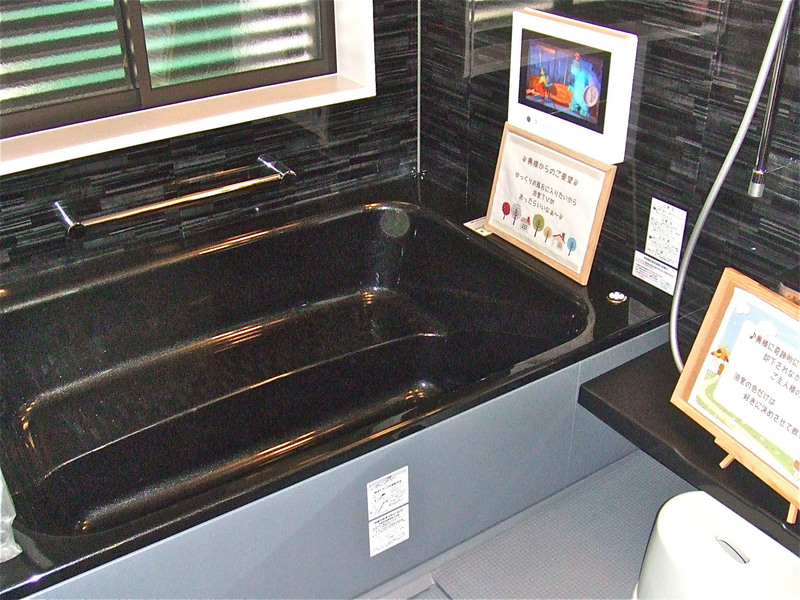 Japanese people love their evening bath, but tubs in private residences are a relatively recent development. By 1963, only 60 percent of Japanese homes had them. The small amount of living space necessitated by economic reality, not to mention the paucity of indoor plumbing, couldn’t accommodate bathrooms, and the sentō, or public bath, provided enough daily luxury with its large communal facilities. But as workers became more affluent and construction of new dwellings continued apace, even renters starting demanding their own bathtubs and toilets. 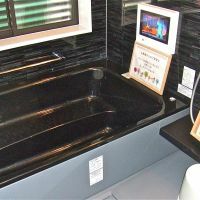 The “system bath” or “unit bath” revolutionized the housing market, and as with expressways and some other modern conveniences it was introduced to Japan by means of the 1964 Tokyo Olympics. The system bath incorporated a toilet, a sink and a Western-style bathtub into a single prefabricated unit that could be installed easily and quickly, and it became a famous feature of the Hotel New Otani, which had to be finished before the start of the games. Had the hotel’s 1,044 rooms utilized Japanese style baths, which provide for a space outside the tub where bathers can wash themselves before entering it, construction couldn’t have been completed in time. The Japan Housing Corporation adopted the system bath for the tens of thousands of apartments it had planned for the country in the 1960s. These apartments, both for-rent and for-sale, were characterized by two new features, the dining-kitchen area and the bathroom, which provided space for a Japanese bathtub. The toilet had its own compartment and the sink was installed in the dressing area. With Western baths, water is heated remotely and then transferred to the bathtub. In Japan, the water is heated in the bathtub. However, in the beginning the JHC didn’t install bathtubs. It simply built bathrooms that could accommodate system baths with space outside the tub for washing the body. The owner or tenant would have to buy the bathtub apparatus from a vendor and have it installed. (see side bar) Formerly, such bathtubs had a compartment on the bottom where wood was burned to heat the water in the tub. JHC installed gas outlets in residential bathrooms for a kama (heater). 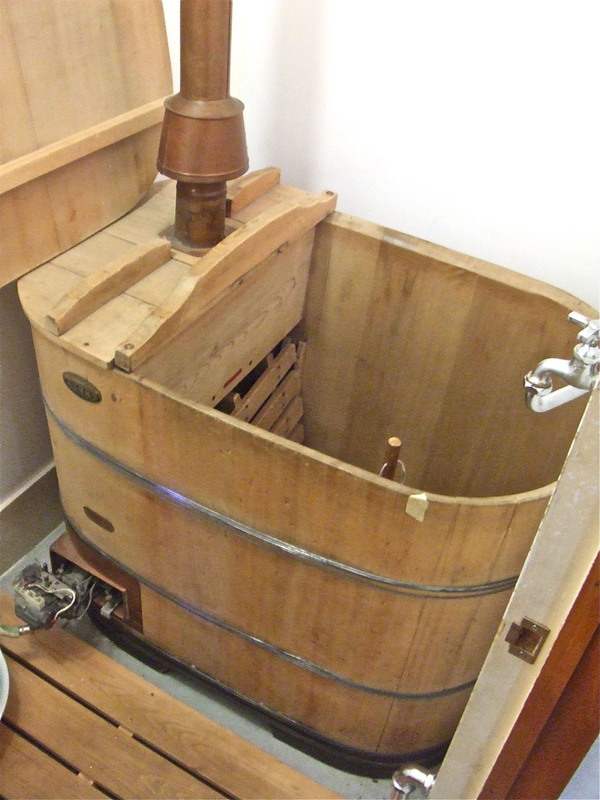 Eventually, manufacturers developed the BF bathwater heater, which was separate from the tub itself. BF stands for “balance flue,” and refers to a set of two pipes, one sending water from the tub into the heater and the other sending heated water back into the tub. This self-contained heating concept is known as oidaki and remains standard, even as houses and apartments started using central water heaters. 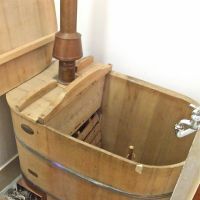 The main idea is that the temperature of the water in the tub is maintained over the course of an evening, so that every member of the family can take a hot bath in succession. And since users wash the body outside the tub the water stays cleaner longer and can be reheated on subsequent days. Thus, the oidaki system helps to conserve energy and water. Though bathrooms in modern apartments and houses don’t look anything like their ancestors, the system bath is so dominant that anyone wishing for something simpler or, for that matter, more “traditional”— tile and grout, wood —will likely meet with frustration. In our case, neither of us take evening baths and so the system bath seems a waste of space and resources. More to the point, its prefabricated nature makes for a dull aesthetic impression that is only partially alleviated by stylistic touches. A simple bathtub with no oidaki system and a shower attachment is enough for us; or even no bathtub at all. But when it comes to remodeling older houses and apartments we’ve been told that our preference is not only expensive, but one that might undermine the integrity of the structure. The bathroom uses more water than any other place in the home, and moisture is bad for buildings. Steam gets into spaces and condensation forms behind walls and under floors, causing mold and rot that can’t be seen, no matter how clean you keep your house. One remodeling company claims that wet rot brought on by improperly sealed bathrooms is the leading cause of house collapse during earthquakes. System baths, their proponents insist, solve this problem because the whole bathroom is designed as an integrated unit with the fewest possible points where water can escape and come into contact with the frame or foundation. Moreover, system baths utilize a dry construction method — no cement, plaster or mortar — which not only makes it cheaper (no tradesmen) but also faster to install. These advantages may be more beneficial to builders and manufacturers than to homeowners, but in any case the majority of the latter prefer system baths because they still fit the Japanese lifestyle. Since about 1985, almost all Japanese housing has been designed with the system bath in mind, and as with any standardized commercial facet of modern life you get what you pay for — so if you pay enough, you can get a system bath that doesn’t really look like a system bath. Philip Brasor and Masako Tsubuku blog about Japanese housing at www.catforehead.wordpress.com. When the Japan Housing Corporation introduced bathrooms in the 1960s, it didn’t provide bathtubs. As with washing machines and refrigerators, residents had to provide their own. Eventually, JHC did include bathtubs, but prefectural and municipal public housing entities kept the no-bathtub policy for years. Many still do. And when tenants move out of these apartments, they have to take their bathtubs with them. In 2008, auditors criticized the Tokyo Metropolitan Government for maintaining this protocol in some of its public housing, saying that since municipal public housing was designed for low-income families the burden of buying and installing a bathtub, which costs between ¥100,000 and ¥300,000, could be punishing. Moreover, since they had to remove the bathtubs when they left, the policy gave rise to needless waste, since it was assumed former tenants would be moving into residences where there were already bathtubs and wouldn’t be able to sell the ones they removed from their previous apartments. The reasoning behind the policy, which is being phased out in Tokyo but is still in effect in Osaka, Chiba, Saitama and other cities and prefectures, is fairness. In the beginning, it was thought that since all collective housing couldn’t have bathtubs none would. Eventually, private apartments and JHC broke with this policy, but local governments were slower to do so since it required changing local regulations. And in accordance with Japanese rental protocol, when a tenant moves out he has to leave the unit exactly as he found it, so if there was no bathtub when he moved in there couldn’t be one when he moved out.